This was quite a busy and noisy pub. The patrons were watching the football scores come through on the TV. Fairly unremarkable pub which had Doom Bar, Wandle & Ghost Ship all on. my local. 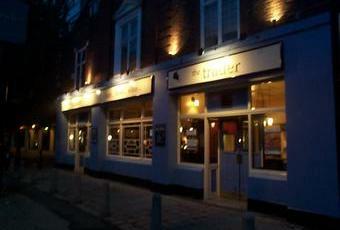 really nice pub. very friendly and efficient staff and great food. ale selection could be a touch bigger - usually 4 taps and 1 will be repeated so giving 3 ales but they are usually quality beers. Quite a nice pub - part of the Smith and Jones chain if I remember their name rightly - on what is actually a pretty grotty street running north from the Barbican up to Old Street. A spacious inside and four real ales on when I visited, including Sharp's Doom Bar and IPA. Clientele looked to be made up of local office workers, although I'm not sure how many offices there are round here, and I'd have thought this a bit far for workers from the Barbican area to bother venturing to. 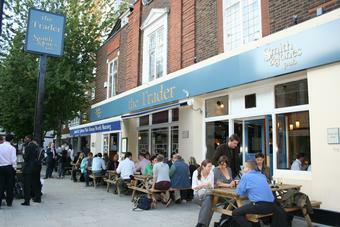 Spent time at The Trader Aug 2008. Very clean, great atmosphere, great food. All staff very friendly and accomodating. Will be back on our next visit to the UK.